Service Costs > How Much Does Wood Rot Repair Cost? How Much Does Wood Rot Repair Cost? Wood rot is a form of fungal decay that can affect wood in almost any setting. Because wood contains a certain level of moisture, it attracts fungi and provides a suitable breeding ground for it. Besides, homes that are made of wood, even if only parts of it, are vulnerable to wood rot because certain parts of the home can eventually become damp through the regular wear and tear of the years. Wood rot can occur in any area of the home such as the structural beams, door trim, exterior trim, and windowsills. Its symptoms usually come in the form of cross cuboidal cracking or mycelium on the surface of the wood. How much does it cost to repair wood rot? The cost to repair wood rot will depend on the extent of the damage, the affected location, the professional you decide to hire and where you live. With so many variables, the price of a repair could range as little as $150 to replace a porch support to as much as $25,000+ to replace a wrap-around porch. Because there are so many variables, consider receiving multiple quotes for free from licensed contractors in your area by using HomeAdvisor.com. Here, you simply describe your job and contractors will contact you with a no-obligation quote. For instance, if you had to replace some existing siding that has wood rot could cost $100 to $1,500, but most jobs, according to siding contractors, will be about $200 to $600 or about $5 to $8 per square foot, with a $150 to $250 job minimum before they even accept the job. As for replacing a few deck planks on an average sized deck, the costs could be in the $400 to $1,000 range, but if the deck had to be completely rebuilt, this could skyrocket well into the $5,000 to $10,000+ range, depending on the deck’s size. To fix wood rot around a window, the average cost can be around $180 to $400, depending on the window and the extent of the repair. Another common wood rot fix is often seen on the front porch, where the posts are often replaced due to rot. Replacing one or two posts could cost about $200 to $600, but again, if the porch were in poor condition, the costs could reach well into the thousands, depending on the size. Small roof repairs, commonly seen around the fascia, can be close to $150 to $400 or $50 to $100 per hour. Lastly, if the wood within the walls were rotting, the costs, again, depending on the extent of the damage, can be about $300 to more than $1,500 per 10 to 20 feet. Again, these are all averages and can greatly vary depending on your circumstances. Replacing a deck, for instance, will be much more than taking out a few planks and replacing them. Be sure to talk with local contractors to get an exact quote. On this City-data.com forum thread, a forum member who started the thread said he received a quote for $1,250 to replace several sections of rotting boards at his townhome. Depending on the size of the job and what caused the wood rot, many of these jobs can be performed by either a general handyman, painter or even a pest control company if the damage were due to pests. However, if the wood rot is extreme and a good portion of your siding, deck, porch or any other large structure needs to be partially replaced, then it’s a good idea to contact a contractor who specializes in that field. A simple dry rot repair is relatively straightforward. The affected wood will be scraped away and the area will be drilled in a honeycomb pattern to help the epoxy penetrate through the decayed area. This epoxy liquid will settle in the holes and will be allowed to cure and dry. Once dry, a putty-like epoxy will be used to fill in the missing area, and as it dries, it will harden to create a smoother surface that blends in with the natural wood. This process is only used for smaller jobs. If the job were much bigger, such as replacing deck boards or porch posts, then the wood will be completely removed and replaced. In some scenarios, wood rot is caused by pests such as termites or carpenter ants. If this were the case, you will need to pay for either a professional exterminator or a pest control solutions to keep the pests from outside your home. An inspection and report can cost a minimum of $150, whereas the actual treatment can cost hundreds of dollars, depending on the damage and pests. Wood rot comes in three types, namely: brown rot, white rot, and soft rot. All these types can significantly lead to structural damage. 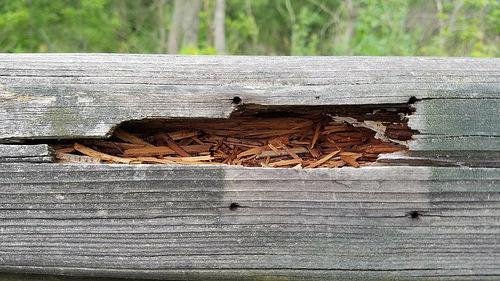 Brown rot, which usually results in dry, fine wood, incapacitates the wood from supporting any weight, eventually leading to the crumbling of the structure. White rot turns the wood’s color into a gray, white, or yellowish hue, resulting in a fibrous wood. Soft rot, which is least common of the three, attacks wood shingles in wet areas. Once you notice wood rot in your home, you should remove all of the affected wood and repair the damage; otherwise, it will eventually cause leaks in your home or it can invite mold, carpenter ants, termites, and other house-destroying pests into your home. Usually, the damage caused by dry rot is not covered by a standard homeowner’s insurance; however, they may cover it if it were due to a natural disaster such as a flood or earthquake. It doesn’t hurt to talk with your homeowner’s insurance company to see what they will and will not cover. For smaller jobs, consider a simple DIY kit, which includes everything you need in order to resolve the issue. These kits can cost less than $30 and will use a water-based hardener, epoxy paste and putty to restore the wood to its original look. To avoid wood rot, you should paint your home every three to five years and apply a wood rot treatment on all exposed wood inside and outside of your home. Since moisture attracts fungi that eventually causes the wood rot, the best thing for you to do is prevent water or any moisture from seeping into your home. You can do this by resolving drainage problems, sealing cracks, and/or fixing plumbing leaks at home. If you’re unsure, consider talking with a home inspector to have them look for any troubling spots. As with any repair, always get as many estimates as possible before deciding to hire someone. Aside from the price, also focus on their reviews, references and any past work they have done.